TenderBoard - Will you benefit from an e-Procurement system? Are you considering migrating from a manual procurement process to a digitalized system, and wondering if it would be worth your while? The investment in an e-Procurement System goes beyond just the funding needed for the software solution. For an e-Procurement Transformation to be successful, it takes more than just purchasing a suitable e-Procurement System, it also involves tuning your procurement processes to take advantage of a digital system (and we would argue, an online SaaS system), ensuring buy-in from stakeholders (both the company’s staff and suppliers), as well as proper training and follow on coaching to ensure that the intended benefits are derived. If you’re wondering whether the time is right to make a switch to e-Procurement, we’ve put together a simple survey of 13 questions that provides a guide to weighing the pros and cons. These are organized into 2 sets of questions; the first 10 questions help you figure out how much benefit you could derive from making the switch, and the next 3 helps to figure out if your organization is ready to switch. Do note that this article was written with organisations who are still using manual processes to manage their procurement activities in mind. 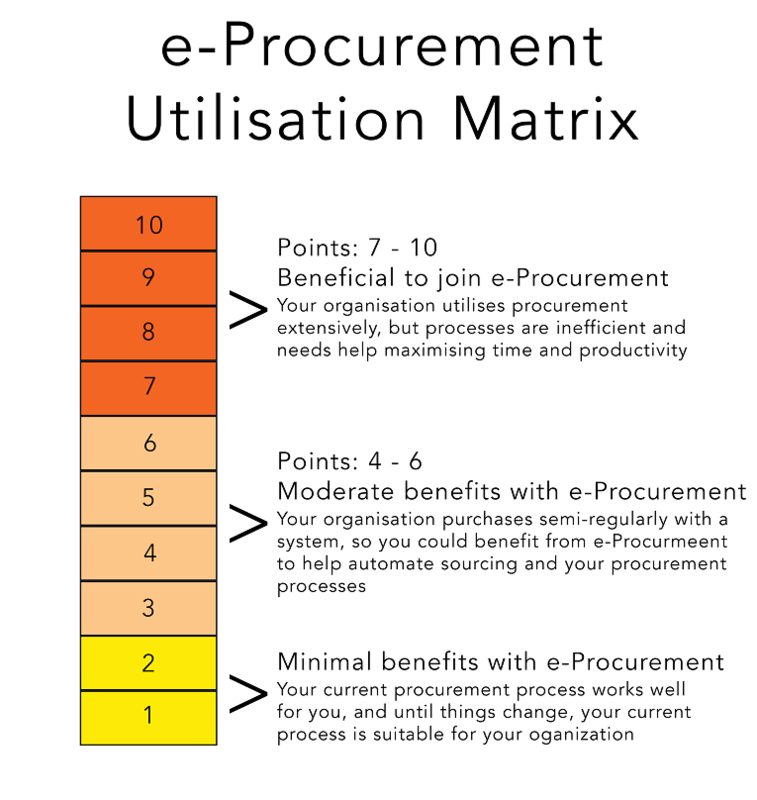 First Set of 10 Questions: How much benefit can I get out of migrating to e-Procurement? *Yes = 1 point, No = 0 points. Take note of the number of points you have, and once you’ve completed the questions, tally up the number of points you have and compare it against the score matrix below. We require approvals prior to initiating sourcing or awarding a purchase. We spend a lot of time looking for relevant suppliers to provide quotations. We communicate with suppliers through various channels including emails, phone, text messages and even snail mail. We require a centralized repository of supplier information. We need spending transparency and accountability. We need to ensure that suppliers get equitable treatment during sourcing events (e.g. everyone has the same information and time to prepare their proposals). Our purchases are subject to audits. We need to standardize our procurement practices and ensure compliance. We have more than 5 people involved in procurement. We make more than 2 purchases a month. Second Set of 3 Questions: Is my organization ready to migrate to e-Procurement? We have management support for the project. We have a champion who owns the project and who has the authority to mobilize the necessary resources. Our staff and suppliers will be able to buy in to the project. We hope this has given you a framework to start thinking about whether a migration to e-Procurement would be beneficial and if so, how to ensure it is the right time to migrate. It is important to remember that switching systems is not a trivial task, so it is crucial to ensure the project is set up to succeed. This starts with having the right conditions within the company to support change, but there are also considerations on project planning and management, change management and supplier selection. We will cover these considerations in the next article, stay tuned! Check out Why e-Procurement? to better understand what e-Procurement platforms offer to help improve productivity, with painless sourcing and easy governance. TenderBoard is an online eProcurement System and B2B Marketplace. We help Buyers digitize and automate their procurement processes, and have a proven track record of successful project implementations. Reach out to us to find out if we are a good fit for your organisation.